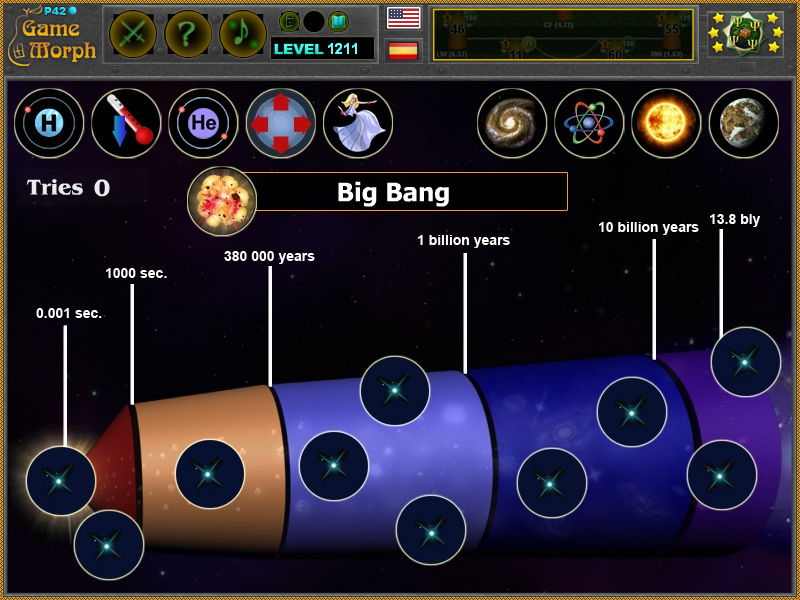 10 stages of universe creation in a fun online astronomy learning game. 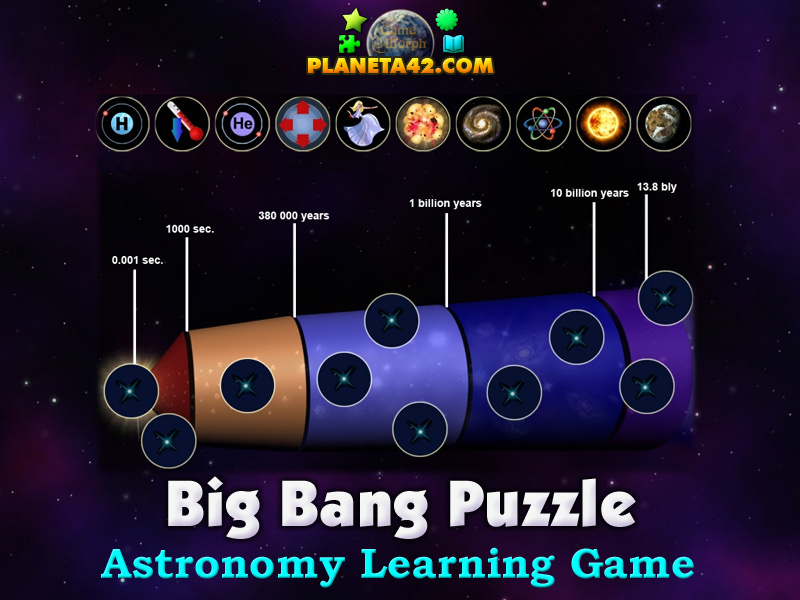 "Big Bang Puzzle" is a free online knowledge level game to sort the stages of the Universe expansion in correct order. Minute to win it game. Astronomy learning game, suitable for online classes and interactive lessons. Fun astronomy educational game to study the evolution of the Universe, Universe creation and space time. Part of the Interactive Astronomical Observatory educational tools. Big Bang - 0-0.001 sec. Inflation, quarks, bosons, mezons - 100 sec. How to play Big Bang Puzzle. There are 10 pictures of the stages of Universe creation on the top of the screen. Drag and drop them in the correct order of the space time diagram. Know the 4 major stages of universe expansion. Class subject: History of the universe. What we now know is thet the Universe is 13.8 billion years old and it is still expanding. At the beginning there was the big bang, which makes the emerging of space and time togather. In the next 1000 seconds the Universe begun expanding with enormous speed, where for a fraction of the second, from the size of a bean it may become the size of planet. This period is called "Inflation". In the next 300 000 years it experienced a rapid drop in temperature. Then the first atoms were formed. They formed the first elements, hydrogen and helium, which happen to be the most common elements in the Universe. The photons no longer interacted with other particles, making the Universe transperant. At the age of 1 billion yeras, clouds of gases begun to bind togather to form the first stars. The stars also experiencing gravity forces formed clusters to create first galaxies. Then after about 10 billions of years from big bang, the first born stars begun to die out, ejecting materials for the first planets formation. 3.8 billion years later the first humans appear. They evolved from an ape to a human for a tiny fraction of the space time scale, which makes it very possible a lot of other life forms to have existed, thrived and perished since the formation of the first planets. Labels: Astronomy Games , Universe , Puzzle Games , Browser Games , Learning Games , Education Games , Free Online Games.